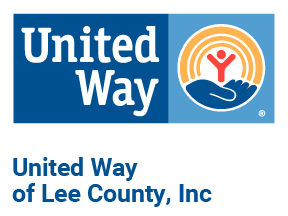 The Mission of the United Way of Lee County is to increase the organized capacity of people to care for one another. One of the ways that we do this in our community is by generating and applying the necessary resources to meet the needs of the community, recognizing that meeting basic human needs should be the overriding consideration in all decisions. United Way works to impact the community through four focus areas: Helping Children and Youth Achieve their Potential, Promote Health and Financial Stability, Aid in Time of Crisis or Disaster, and Strengthening the Community as a Whole. These are the building blocks of a good life and a strong community: Education, Income and Health. 2-1-1 Information and Referral - provides the community with an easy 3 digit phone number to access health and human services. William Mason Emergency Funds - emergency prescription assistance program for individuals without health insurance. Help Me Grow! - for parents of young children with questions concerning their growth and development. Stuff the Bus - school supply drive for qualifying students in our local community: Auburn City Schools, Lee County Schools, and Opelika City Schools. Fan Distribution Programs - supplies portable fans to individuals with no other means of cooling their homes in the summer months.